Wakeup Cosmetics is a new brand of cosmetics, offering a fresh lineup of contemporary products from makeup and skin care all the way to nail care and fragrances. For the main white fiberglass forms, our goal was to generate elegant functional sculptures that morph between the various geometric needs. 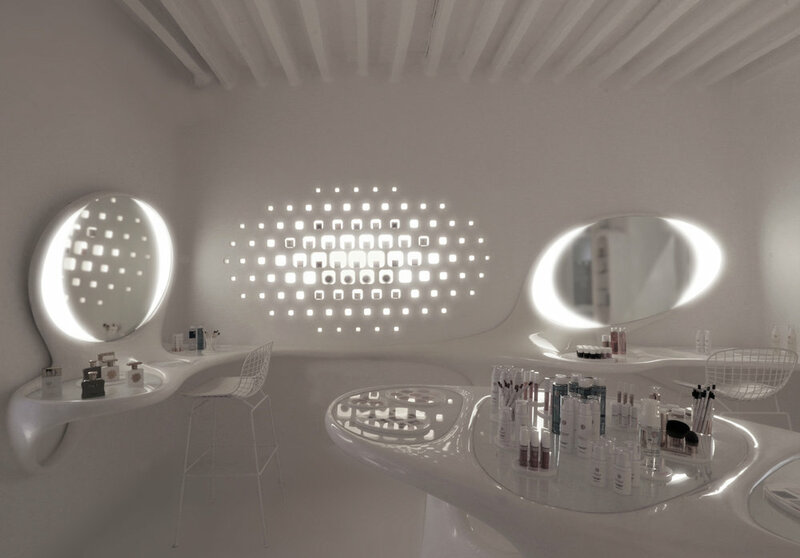 In this case, geometry was conceived as an fluid structure that connects and supports the horizontal and vertical ellipse shapes, needed by the makeup stations and display stands. The emphatic use of white together with the fluid character of the forms results in a space that is very contemporary but at the same time very coherent with the indigenous aesthetic of Mykonian streets.